Recently originating in Malaysia, Seramas are the smallest recognized chicken breed in the world. Seramas hatch 1-3 days earlier than other breeds and are known for their upright posture, full breast, vertical, upright tail feathers held upright and close to the body, and vertical wings held down nearly touching the ground. Seramas come in wide variety of colors and feather patterns. 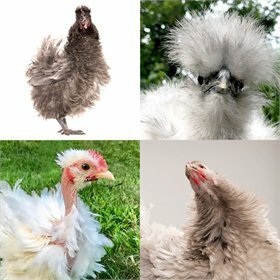 Some of My Pet Chicken's Seramas are silkied or frizzled! 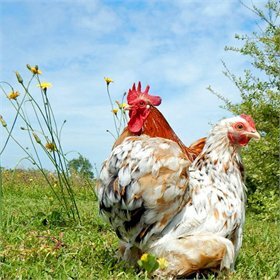 Believe it or not, although their eggs are TINY, Serama hens are fantastic layers of cream-colored eggs, and start laying around 5 months old! Seramas may have white or yellow skin. They also LOVE to be broody and raise lots of babies for you.